In 1973 at the Second Conference on Baltic Studies in Scandinavia, Professor Steven Reynolds, then at the University of Oregon, presented a paper entitled “The Baltic Psaltery: Bibliographical Problems and Desiderata.” In his paper, Reynolds described virtually all the published research on the Baltic psalteries up to that time. Since then there has been a large amount of research conducted by scholars within the Baltic countries, Russia, and North America. Significant research has been undertaken on the Finnish kantele (Leisiö, Laitinen, Rahkonen, Saha, Hakala, Smolander-Hauvonen), the Estonian kannel (Tõnurist, Haas), the Lavian kokles (Jaremko, Muktupavels, Priedite), the Lithuanian kankles, (Apanavicius), the Russian gusli (Vertkov, Povetkin, Zhoukov and Maraev, Temkin) and the Baltic psalteries in general (Haas, Temkin). Starting with Reynolds’s work, my paper will examine the current state of research and publication on the Baltic psalteries to the present time. Many of the bibliographical problems described by Reynolds have been solved, largely due to the changing geo-political landscape and the coming of the Internet, but some challenges still remain that impede international cooperation in research. I will evaluate the major Baltic psaltery studies of the past 35 years, their significance to one another and to earlier research, and will make some suggestions as to “where we should go from here” in Baltic psaltery research. 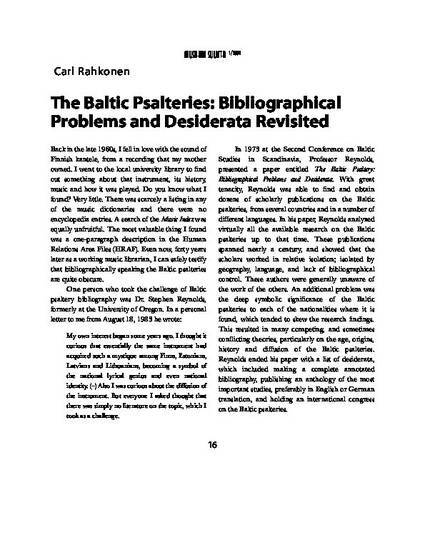 “The Baltic Psalteries: Bibliographical Problems and Desiderata Revisited.” Musiikin Suunta [Finnish Ethnomusicological Society Journal] (No. 1, 2009): 16-24.